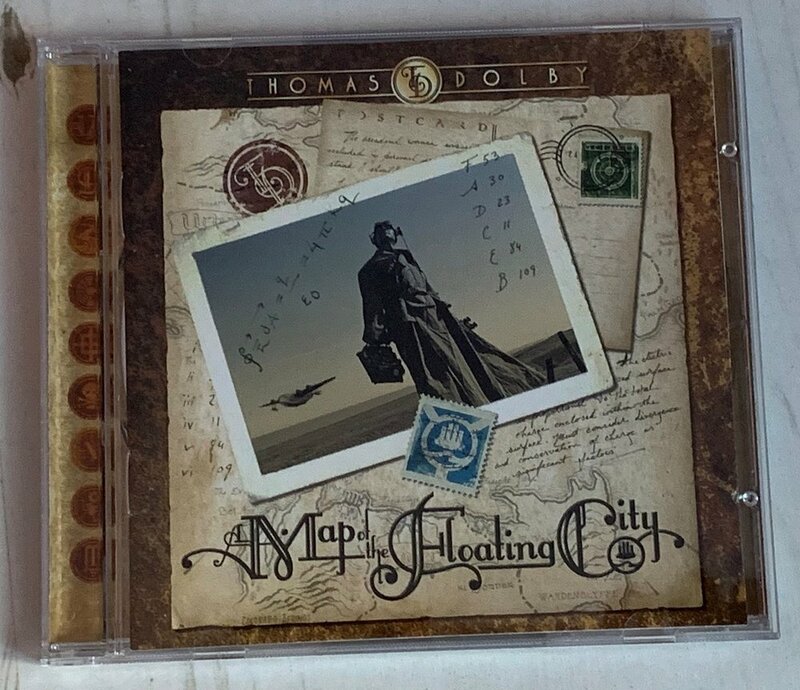 Achievement Unlocked: Got a copy of "Map of the Floating City"
When I used have a Groove Music Pass on my PC (I call those the ‘Good Old Days’) I got very attached to the album “A Map of The Floating City” by Thomas Dolby. When that died (very sad) a while back I ended up switching to Apple Music. Which is actually pretty rubbish in many ways. One of them being that, for some reason, this album is not available. Neither is first track of “The Nightfly”, one of my favourite ever albums. And Apple Music seems incapable of playing tracks in the same order as they are on the record. And some music doesn’t show up in the car. And also…. But I’m starting to rant, so lets move to a new paragraph. That’s better. Anyhoo, I tried to buy the CD and it is really quite hard to get hold of. I’ve ended up importing a copy from the ‘states. Well, it arrived today and it sounds as good as I remember. Say, perhaps, you're spending great chunks of your day writing stuff, and you want something to play really loud, I can strongly recommend this from Smash Mouth. Oh to be in Hull in the summer time. This summer is astonishing in terms of the range and quantity of goings-on in the city. We wandered up town on Saturday for lunch at Nibble (wonderful place, you should try it) and found ourselves listening to a BBC Prom being broadcast from the stage right next door. Full orchestra action. The city was also alive with a whole bunch of folk acts around the town, numerous Morris Dancers and a Gay Pride march. I've liked ELO since, well, forever. And when I found out they were coming to Hull, I got tickets. They were playing at the KC Stadium. It's big. And it was full. ELO did not disappoint. The support from The Shires and Tom Chaplin deserves special mention too for being excellent too. At the end they created enormous plumes of fire in time with the music. Awesome. A fantastic night that was only slightly let down by the one hour we spent in the car park trying to get out. The guide for the event said that "entry is gained by cash payment to the cash handlers". Sure enough, on arrival there were people in high-visibility jackets to take our money and direct us to our parking spaces. Unfortunately the guide also contained the ominous phrase "Vehicles exiting the car park are allowed to self regulate". What this meant was that come closing time all the chaps in high visibility jackets had disappeared (presumably to count their money) so there was nobody to direct the traffic, resulting in an enormous log-jam of cars going nowhere. But it was still a great concert though. If you're of a certain age, like me, then you'll remember Al Stewart. His Year of the Cat album is one of the best records ever made. With Time Passages running it a close second. Both albums had amazing cover art too. Number one wife spotted that he was playing live in Hull tonight as part of his "Back to the Bedsit" Tour. Of course I got tickets. There were just three musicians on the stage. Dave Nachmanoff, Tim Renwick and Al Stewart himself. And the sound was awesome. The show started with a solo spot from Dave Nachmanoff, which was excellent, and then Al Stewart hit the stage with him for some songs and stories. The stories were a nice element. Any anecdote which contains the phrase "..and then Paul Simon and Art Garfunkel turned up in a silver Rolls Royce...." is alright by me. Tim Renwick was introduced as "the man who did all the impressive guitar playing on my albums" and he's lost none of his style. The solos were note perfect and sounded really good. And three really well played guitars (and a bonus violin on one track) made for some splendid versions of some of the classics, including the "Year of the Cat" song of course. A great night out, if you've got fond memories of the old albums (and have kept your vinyl originals) then you won't be disappointed. The Groove music player on Windows 10 is getting better with each release. It now has a feature that creates playlists for you based on your record collection. It used to have a fantastic list for me called "Ramshackle Rock" which had picked a few riotous sounds from my collection. But now it has vanished. And I wish I could remember the tracks that were on it. Sad face. However, there are some new playlists popping up all the time and some of them are good too (at least from my point of view). What I really want (are you listening Groove folks?) is a quick way of taking one of your neato playlists and persisting it. It turns out that I can select all the tracks from "Now Playing" and then save them into a list, but you have to know that you need to do this. Oh, and all of the albums in the image above are awesome. If you've not heard them, your're seriously missing out. I don't know who thought of it, but it's a brilliant idea. One of the best things about Bond movies has always been their soundtrack. And they've just released the soundtracks for a bunch of the early Bond films on 12 inch vinyl LPs. I found a bunch of them when I was up town today and for a moment I thought I'd dropped through a time warp. They've got proper, printed, card sleeves with the original artwork. I'm tempted to get one just for old time's sake. You can also get high definition digital versions too. Click on the image above to find out more. Bit of a stinker if you've been watching your treasured, collectable originals go up in value over the years, but great for the rest of us who can remember when Bond was proper cool. A singer called "Tallest Man on Earth" is going to catch my eye every time. They were giving away free iTunes tracks from him at Starbucks and I grabbed the card, found him on Groove and downloaded his latest album on my Music Pass. Probably not how Apple would like their marketing to turn out. But the music is good. Catchy tunes well played and sung. 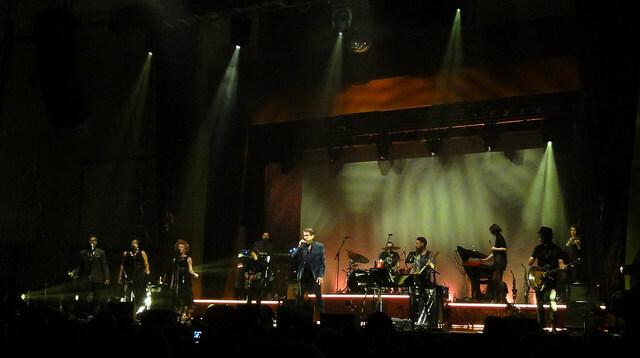 Tonight we headed off to Bridlington Spa to see Bryan Ferry and his support artist. Who turned out to be Judith Owen. I'd not heard of her before. 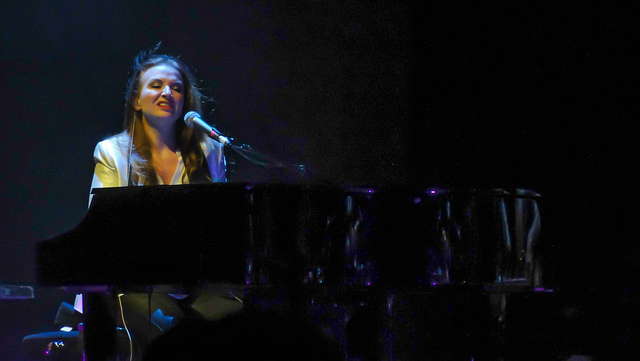 Great voice, great piano playing and an amazing band. of musicians providing support. If you are as old as me (and good luck with that) you'll remember such people as Waddy Wachtel ,Leland Sklar and Russ Kunkel. Pick a hit album from the seventies, eighties, nineties, noughties or now and it's odds-on that at least one of them played on it. To pick just one random example, Waddy Wachtel played on "Lonely Boy" by Andrew Gold, one of the best records ever. Ever. Just as they finished their set I looked up Judith Owen on Xbox Music and found out another interesting fact. She is married to Harry Shearer, the voice of Mr. Burns in the Simpsons. During the interval I wandered off to find them selling and autographing CDs. I got the whole band and did the whole star struck bit, shaking hands twice and whatnot. But I was wrong. Bryan Ferry came on and did an absolutely storming set. Backed by a fantastic team of musicians he ripped through a choice selection of his back catalogue, including a few Roxy Music numbers and tracks from his new album before bringing the crowd to its feet for the last few songs. Including a blazing version of "Do the Strand". General consensus at the end of the evening was that "Bryan has still got it going on.". HIs tour is continuing round the country. If you get the chance to go, just go. Thank me later. I have a bit of a thing about sound quality. When I was younger (and had much better ears) I was very into High Fidelity sound and would spend many happy hours fiddling with big vinyl disks, turntables, cartridges, amplifiers and speakers to get the best possible sound. I've continued being a bit snobbish about recorded sound. Most audio devices around today actually sound extremely respectable, including of course my Lovely Lumia 1520. But I can always convince myself that there are better things out there. Which brings us to the Sony Web Enabled Multimedia Walkman, or if you prefer, the NWZ-F886. This is best regarded as an Android phone without the phone bit, but with really good quality audio hardware and the ability to play uncompressed audio file at lots of bit rates. I've been after an Android device for a while. I want to use it to remote control my camera (see above) and also as the target for Xamarin apps that I fancy having a go with. So I've invested in one. The sound quality is really, really good. The Sony comes with a pair of noise cancelling earbuds that work really well. I dragged some of my MP3 files onto it and they sound great. Then I used dbPowerAmp to rip some of my CDs into lossless FLAC files. These are audio files that are a lot bigger than compressed ones, but have all the data still present. The difference is definitely there. They sounded truly amazing. The next step is to download some high definition master tracks from somewhere like HDtracks and I'll have something that is far, far, better than my ability to hear it. The only pitfalls in my quests for the ultimate in audio are the cost of the files themselves, the fact that hardly any are available in the UK due to licencing issues and the limitation that the Sony device only has a comparatively paltry 32G of internal storage. Having said that, I once made the awful mistake of putting all my purchased audio onto one of my devices. This made random play a minefield containing some horrible stuff that I should have been ashamed of owning. By carefully curating the limited space I should be able to guarantee a great experience every time I press play. The device itself is small and sleek. It runs Android apps well enough and has the usual Sony high standard of construction. Unfortunately it also has the usual Sony insanity of a completely bespoke USB cable that I am bound to lose sooner or later. At the moment I'm solving that problem by leaving the cable in the player at all times, but this makes it a bit less portable. The trajectory that is making your phone the centre of everything means that things like portable music players are going to end up as fringe devices I guess, but this is a really, really good one. If you are serious about carrying high quality sound around with you it is well worth a look. His album art is usually pretty special too. Thomas Dolby is one of my favorite artists. He's done sterling production work with Prefab Sprout and other bands, and every now and then he makes an album. And unfortunately, nothing much happens after that. Such is the life of a recording artist. Anyhoo, a couple of years ago he made another one, without telling me. I've only just found it. A Map of the Floating City is splendid stuff. Some songs are poignant, some silly, and all different. He has some high powered collaborators too, including Imogen Heap, Mark Knopfler and Eddie Reader. You should definitely seek it out, if only to listen to The Toad Lickers. I used to like buying old style vinyl records. There was something rather nice about going into the record store and coming out with a twelve inch slab of plastic in a large sleeve. Of course that’s not how we consume our music these days. I got this album for “free” because I’ve got my phone tied in with the Xbox Music “All you can eat for ten pounds a month” deal. Nothing physical moved anywhere. And I haven’t got a nice album sleeve to look at. But the music is splendid. I’ve always liked Goldfrapp. No two of their records sound the same. If you like ambient, tuneful, stuff you’ll love it. Not my best record deck, but not bad for 22 year old plastic Panasonic device. Donald Fagen, half of Steely Dan, has recently released a new album. Since he is the guy that made “The Nightfly”, one of my all time favourite records, I thought I’d celebrate by buying a version on vinyl. It arrived today. A three sided album. The fourth side really is just shiny plastic. I grabbed my little record deck back from Mike’s office, where it has been languishing for a while, took it home and fired it up. It sounds great. Very much in the same style as later Steely Dan stuff, which is not terribly surprising I suppose. If you like complicated, laid back, jazzy sounds then you’ll like it. Not sure if It sounds better or worse than the CD version to be honest, but it really does sound good. I’m terribly impressed by the way that we managed to get such amazing sound quality from a plastic disk with a wavy line pressed into it. When you consider the complicated processing power that is used to move music around today, it seems incredible that my stereo reel to reel (which I must get down from the loft some day) made do with 18 transistors. And my first amplifier didn’t have many more. I’m not sure that I want to go back to the day when skipping tracks meant waving a needle around just above some very easily scratched plastic, and where every twenty minutes you had to get up and change the record, but just this once I reckon it is worth it. I actually own this single on 12” vinyl. 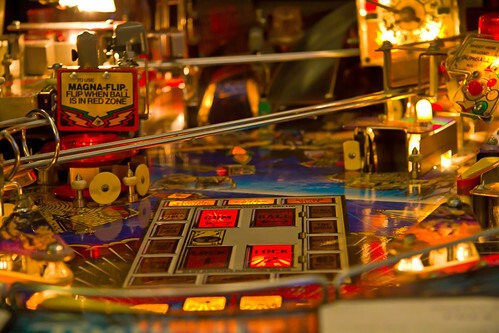 I bet it is worth a fortune now…. One of the nice things about having a Zune Pass is that I can track down old bands that I used to listen to in the old days. Like Living in a Box. I’m sure you’ve heard the title track of album and band. Good stuff. The rest of the album is 80’s synth pop, but none the worse for that. Got your Zune Pass Yet? If you’ve got a Windows Phone and you haven’t checked out the Zune pass yet then you are missing out. Zune pass is an “all you can eat” deal which lets you download and store loads of music onto mobile devices and PCs. You pay a monthly fee to keep the music going and you can have as much of it with you as you can fit onto your Windows Phone or Zune. You can chop and change your tunes as much as you like and keep a different range of sounds on each platform. Of course the bad news is that if you stop paying, it stops playing but I think that for around nine quid a month it is actually a pretty good deal. I really like the way that you can hear a tune you like and then have the whole album on your phone a few minutes later. Windows Phone even has the amazing Shazam application (one of the few programs that I reckon is actually powered by magic) that will put a name to tunes that you play to it, to make the process easier. I’ve been happily downloading content and listening to it. Current favourites is “Jeff ‘Skunk’ Baxter Plays the Hits”. Country music (and other stuff) done real well. I’ve like Air ever since I heard their stuff on the soundtrack of Lost In Translation. They’ve got a new album out, Love 2, and it is jolly good. Imogen Heap is ace. We saw her live in York ages ago and she has gone from strength to strength since then. She has just (today) released a new album, Ellipse, which I downloaded first thing this morning before going to work. It is a wonderful thing this internets, you can go from wanting to having in a remarkably short time. Anyhoo, on first hearing the album is nice and tuneful with some neat vocal touches and sound effects. I’ve not heard anything to top “The Moment I Said It” from her previous album “Speak For Yourself”, but that is actually quite a tall order and these things do grow on you. One of the problems that sitting at a computer all day brings is the way that I seem to end up buying stuff. Like beds. Today it was just music though. I got a copy of Scritti Politti’s “White Bread Black Beer”. This chap has been around a long time (he made some great stuff in the eighties and early nineties) and he still knows how to put together some great tunes. Every now and then Amazon recommends something I might like. I assume that it does this because it likes me. The recommendations are based on purchases I have made, and since a lot of these were presents through the years and included tapestry design books and DVDs of the film Mama Mia, most of the things it thinks I should get are somewhat wide of the mark. (I’ve noticed that you now have the option to disown some of your dodgier purchases, so that they don’t have any impact on what Amazon thinks you might like – which is a good thing). Anyhoo, for some time the Amazon algorithm has been recommending I listen to some Röyksopp and so a while back I bought a CD of theirs. I didn’t buy it from Amazon though, I suppose I’ll have to tell them about it…. I like the music though. If you like Air you probably will too (I think this is how Amazon knew to put me on to it). Electronic ambient stuff (although the latest CD, Junior, has a much more electro-pop feel). Good for driving and background music. Some of it sounds like soundtrack music crying out for a film on top, and it has been used quite a lot for albums and films. Number one daughter put me on to the fact that Steely Dan (best band in world, ever) are doing some shows in the UK later this year. That’s the good news. Bad news is that tickets are 50 quid and there aren’t any for sale at the moment. Never mind, perhaps they’ll add some more dates.